Whole wheat flour is what people depended on for nourishment before the age of steel roller mills and giant mechanized sifters. Back then, whole grain wheat, spelt and durum were coarsely crushed between stones to liberate the flour from its jacket of bran. That coarse, stone-ground whole grain wheat flour, spelt flour and durum flour, is still available today, giving home bakers the opportunity to expand their palette of tastes, colors and textures. 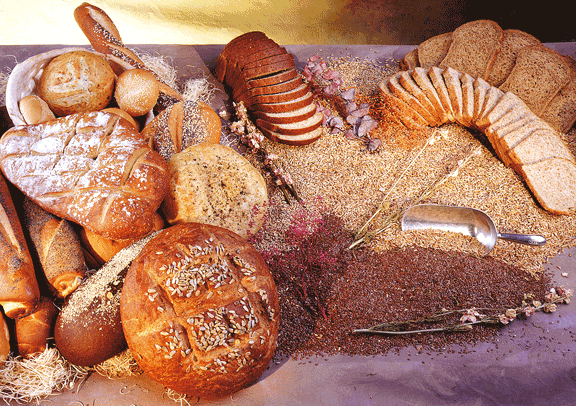 The New York Bakers is pleased to offer this selection of whole grain wheat and wheat-relative flours. With nearly 16% protein and over 40% fiber, wheat bran offers significan nutritional benefits, in addition to its ability to lighten high-percentage rye breads and add a nutty flavor to breads, rolls and muffins. 1-lb./454 g. poly bag. Approximate analysis (14% moisture): Protein 13.7%, Ash 1.80% An untreated flour milled from hard red spring wheat, with a naturally sweet and nutty flavor, rich in fiber and protein, for breads with a rich, mouth-filling and chewy texture. 5 lb./2.27 kg. poly bag. Approximate analysis (14.5% moisture): Protein 12.2%, Ash 0.80% Semolina is one of the hardest of the wheat relatives and one of the richest in gluten. Use it in pasta, rustic breads of southern Italy, Indian and Middle Eastern desserts or to dust your peels and proofing boards. 3 lb./1.36 kg. poly bag.